Terminal 2: Before exiting the secure area please go down the ramp to the lower floor. It will be well signposted. 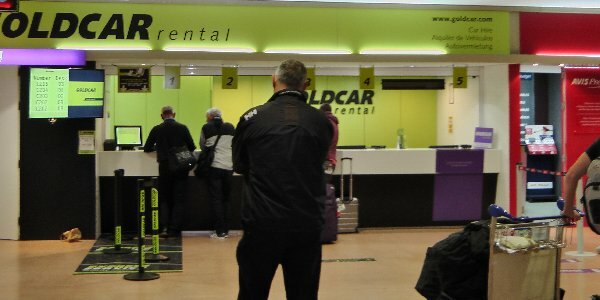 The Goldcar office is the first car hire desk at the bottom of the ramp. Terminal 3: Please follow the Rent-A-Car signs and you will arrive at the same ramp used by the customers arriving at Terminal 2. Walk-in Customers have to go to the AENA car park, take the lift to the -1 floor and go to the Vehicle Drop-off Area where our office is situated. Young driver's age: 21 to 24 years. Charge 8 EUR per day. Maximum 96 EUR Includes 21% tax. Take this opportunity to get the best car rental deals in Malaga... CHEAPER. Gold Car office is located outside the railway station, leave the station through the main Exit Gate located at the front of the building, then cross the road and after walking approx 50 metres on the left you will find the GOLDCAR office in the Street: Calle Explanada de la estación nº 6. Fuel: Pre-purchase fuel with partial refund. Your car will be provided with a full tank of fuel for which you will need to leave a deposit at the rental desk. 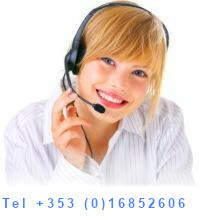 Upon return of the car you will be refunded for the unused fuel and charged an admin fee of approx €26.00 depending on the size of the car. The admin fee is non-refundable regardless of the amount of fuel upon return. 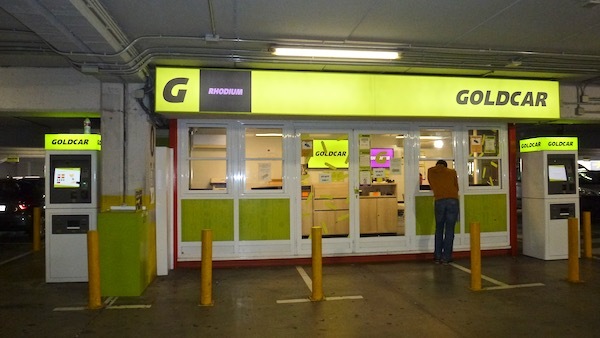 When you are returning a Goldcar please proceed to level 0 in the AENA car park at Malaga Airport. On enterint the Airport just follow the Car Rental return signs and they will bring you to the car park. Goldcar is situated on level ZERO. If you are picking up a hire car at Malaga Airport and not flying in, you can you can pick up the car hire also. You will not be able to pick up the car in the terminal building over head as it is in the secure area.